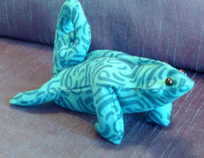 Down load this free e-book to make your own animal bean bag stuffed toys! Long before there were “beanie babies” there was Crab-Bags & Other Bean-Beings, a book published in 1978 to teach kids and adults how to sew these six adorable toys. 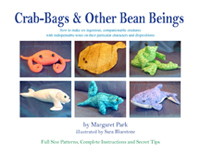 Featuring patterns and stories by Margaret Park and illustrations by Sara Bluestone Crab-Bags & Other Bean Beings was for many years sold through the National Wildlife Federation's Ranger Rick Book Club. At last, it's been re-issued as a Free E-book to delight a new generation of children and sewing enthusiasts. In these six two-dimensional patterns are innumerable enchanting creatures just waiting to leap into three-dimensional bean-being. Margaret Park's ingenious patterns and instructions make this an act of magic anyone can accomplish using ordinary household materials. Doesn't require a sewing machine. Can be made by children as young as ten. Make them for yourself, for friends or sell them at street and craft fairs. They're adorable and easy to make. Guaranteed to solve your birthday, holiday and gift-giving problems for years to come.